Michigan is home to a lot of iconic spots, from 3,000 miles of breathtaking lakes to the birthplace of Ford Motor Company. So it’s no surprise that the Wolverine State is steeped in history. But where can you see all this history? Just about anywhere you look, but we’ve narrowed it down to 15 excellent places. Journey through Michigan’s fascinating past and explore these 15 great historical sites. Coldwater is home to one of the biggest names in theater in the state of Michigan: The Tibbits Opera House. Constructed back in 1882, it's been in pretty much continuous operation ever since, and to this day, it's still running summer theater and other events. A 500-seat theater complete with art gallery and gift shop, it underwent a complete restoration effort back in 2012, and recently had its parking lot repaved to accommodate additional traffic. It even boasts a mural from Disney artist Alfred Pike, and the opera house offers tours by appointment. Those looking for a look at what Dutch life used to be like, and by extension, the life of Dutch settlers in Michigan, need only take a trip to Holland, where Nelis' Dutch Village will help fill in some of the gaps. Open from late April to Labor Day, and then weekends in September, the village comes with a variety of Dutch craft demonstrations ranging from wooden shoe carving to klompen dancing. It comes with a variety of other attractions, but historically, it's the crafts that will have the most impact. One of just five Fox Theaters built by William Fox, the theater incorporates motifs from around the world, offering three levels of seating and a facade that can be seen for blocks when fully lit. Operating continuously since the 1920s—with a bit of a break in the 1980s for a restoration period—it was actually home to the first Johnny Rockets outlet in Michigan, though it didn't remain open long. Several film legends have been spotted there, including Shirley Temple and Elvis Presley. Up around Traverse City, on Walloon Lake, there's a chunk of literary history that won't be apparent until the name dropping's done. Windemere by itself may not mean much until we provide its alias: The Ernest Hemingway Cottage. Declared a national historic landmark in 1968, and built in 1904 by Hemingway's father, the cottage was where Hemingway spent many of his summers until he turned 21. Some even believe that Hemingway's time in Michigan both spawned his love of the outdoors and provided substance for his short stories like "The Big Two-Hearted River." Fort Michilimackinac started life as a French fort before being seized by the British, and even as it migrated politically it likewise migrated in purpose, going from a fort to a trading post. 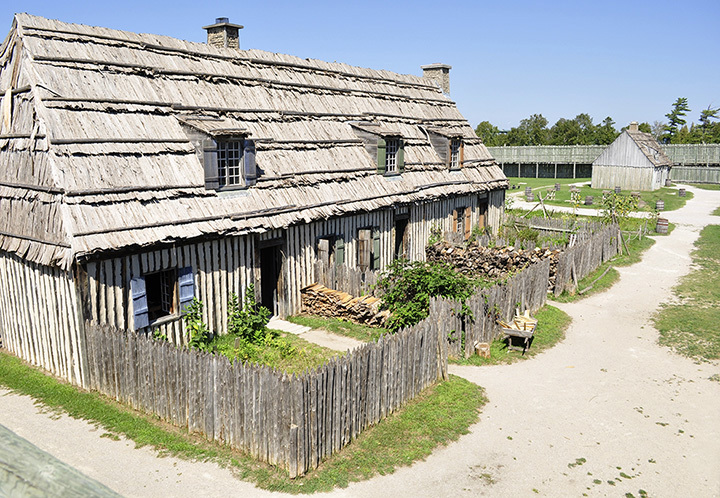 Located near Mackinaw City, which has worked to maintain the fort as a kind of "open-air historical museum," Michilimackinac offers a look at some of Michigan's earliest days as a trading center of furs and similar matter. Today, visitors can check out musket and cannon demonstrations as well as several nearby landmarks like the Old Mackinac Point Light, a lighthouse from 1892. While the name "Alden B. Dow" may not be as immediately recognizable as "Frank Lloyd Wright," there are some that put the two in the same league. The Alden B. Dow House and Studio in Midland, therefore, is a great place to check out the work of this somewhat lesser-known but widely acclaimed architectural mastermind. Called one of the 25 "Best Historic Homes in America" by Traditional Home magazine, and located near the Dow Gardens, viewers will not only get a look at amazing architecture, but also some natural beauty in the process. When it comes to automotive history in Michigan, "Ford," "Chevrolet" and "General Motors" generally come to mind first. Most don't think of the Durant-Dort Carriage Company, and its offices in Flint will represent an even bigger chunk of history than anyone may expect. How big? Without Durant-Dort extending financing help to the Buick Motor Company, and without Durant-Dort founder William Durant's starting of General Motors, a large portion of Michigan's automotive history may never have been. So, for an idea where a lot of it got started, head up to Flint. While checking out the fort near Mackinaw City, consider a stay at the Grand Hotel. Originally constructed in the 19th century, the Grand Hotel is one of the few Queen Anne buildings of that era to survive so long, and if its own press is to be believed, it's also home to the world's largest porch. Having hosted several famous names in its time, from writer Mark Twain to Russian president Vladimir Putin—as well as five separate United States presidents—the Grand Hotel is a historical sight, and site, to see. It may sound strange to give a historic designation to a body of water, but that's what happened in the case of St. Mary’s Falls Canal located near Sault Ste. Marie. Constructed in 1855, the canal is regarded as one of the "...most successful waterways constructed during the ante-bellum era." A huge part of Michigan's economic progress, allowing a means to connect the various Lake Michigan ports with the outside world. Near Baldwin, and not too far from the Red Moose Lodge and the Pere Marquette River Lodge, the Shrine of the Pines features the work of furniture maker Raymond Overholzer. Overholzer's work tended toward the highly natural and the somewhat extreme, including a table made from a 700-pound stump, as well as a rocking chair comprised of roots that's so flawlessly balanced, one start will give it exactly 55 rocks before coming to a stop. Check out the fireplace made from 70 tons of stone, as well as over 400 individually hand-crafted items contained in the nearby Widows Cabin. The Norton Mound Group is home to what's described as "the most important and best-preserved Hopewell mounds in the western Great Lakes region." Formerly home to over 40 mounds, though some were excavated to discover a host of grave offerings as well as insight on how the mounds themselves were constructed. It's not currently accessible to the public, and it's currently under threat by erosion and flooding as well as nearby development, but it's still one of the biggest historical sites in Michigan. In Highland Park, much as the name implies, is another slice of not only Michigan history, and automotive history, but also industrial history. The Highland Park Ford Plant is said to be the "birthplace of the moving assembly line." Though operations largely stopped in 1927 with a move to the River Rouge Plant, and only truck and tractor operations remained, the Highland Park plant was the largest manufacturing plant on the planet when it first opened. Home to Henry Ford and wife Clara, Fair Lane is a massive, sprawling estate named for a section of the city of Cork that was home to Ford's adoptive grandfather. Containing its own electrical power plant (which was sufficiently powerful to provide electricity to parts of the city of Dearborn), as well as a boathouse, riding stables, and gardens designed by Jens Jensen, a major name in garden design, the house itself is currently a museum. Legendary architect Frank Lloyd Wright had a hand in development, though Marion Mahony Griffin actually took over midway through to engage in some redesign. A restaurant as a historical venue? Not that out of line, reports note, this Marshall restaurant's opening was back in 1909, and it's still running almost 110 years later. Home to not only a 700-square-foot patio, but also a slate of special dining options, there's definitely something to be had at Schuler's. Better yet, it's also a great way to start a full day of history, as the town of Marshall is also host to the largest National Historic Landmark District in Michigan. Thus, you can not only eat historically, but you can check out history after your meal. Out in Bloomfield Hills, a chapter of Michigan's educational history awaits. Founded by newspaperman George Gough Booth, Cranbrook is home to a host of properties devoted to education on some level or another. A 319-acre complex, the area is home to the Cranbrook Schools, the Cranbrook Art Museum, the Cranbrook Academy of Art, the Cranbrook Institute of Science, the Cranbrook House and Gardens, and even a complete church, Christ Church Cranbrook. Said church operates, reports note, as a separate entity as part of Michigan's Episcopal Diocese. View more Michigan Historical Sites.